Your fat cat may look cute and cuddly, but inside that roly-poly exterior is a disaster waiting to happen. Obesity is the most common nutritional problem seen in companion animals, says veterinarian Susan Little of the Winn Feline Foundation. In an article in Pets Magazine, she says studies show that 40-50 percent of cats are overweight. And those extra pounds can cause all kinds of health problems, from heart disease and diabetes to arthritis and difficulty grooming and using the litter box. How can you help your fat cat shed some pounds? Here are six weight-loss secrets to help your overweight cat slim down. It’s a good idea to weigh your cat before he starts his diet, so you’ll have a baseline and can set goals and measure his progress. Your cat should lose no more than one or two percent of his body weight per week. How do you know if you’re living with an overweight cat? The average weight for a cat is seven-10 pounds. But a large-boned cat will weigh slightly more. A better guide than a scale is your cat’s overall body condition. If you have to press against your cat’s sides to feel his ribs, he’s probably overweight. You should also be able to see his waist. Looking down at him, his body should be slimmer as you look from the end of his ribs to his hindquarters. This chart shows you how your cat should look. Like they do in humans, extra calories can pack on the pounds in cats. An average size adult cat needs 20-30 calories per pound of body weight a day. About 90 of those calories (approximately 12.5 grams) should come from meat. About 70 calories (5.5 grams) should be fat. While your cat’s dieting, read the labels on his bags and cans of food. Calories on pet food labels are expressed as kilocalories, which are the same as the calories listed on human food packaging. Cats are obligate carnivores and need protein and fat from animal sources, not grains. Wet food is mostly meat and moisture and most closely resembles a cat’s natural diet, says veterinary endocrinologist Deborah Greco. She says fat cats will lose weight on a high-protein, low-carbohydrate, all-wet-food diet. In fact, she calls it the Catkins Diet. What’s so fattening about dry food? Most brands include corn, rice and barley as sources of protein. And even grain-free dry foods need some kind of starch, usually potatoes, to keep the pieces of kibble from falling apart. The problem, says Dr. Little, is that cats don’t use the high amounts of carbohydrates in these ingredients efficiently and store them as fat. Cats evolved eating small prey several times a day. Although most no longer need to catch their food, instinct still tells them they need several small meals a day. Free feeding wet food or offering your cat three or four small meals a day will make his weight-loss program stress free. If you’re not home during the day, a timed feeder will keep his wet food fresh and appetizing. To slim down, your fat cat also needs exercise. And interesting toys that provide a mental and physical workout don’t just burn up calories, they relieve boredom and depression, especially in strictly indoor cats. Try playing with interactive “wand” or “fishing pole” toys together. You’ll have as much fun as your cat! When you play with your cat, make the toy hop and zigzag just like a real mouse or bird would do. And when you’re both getting tired of “hunting,” let him catch his “prey” and carry it off to a safe place if he wants to. Beware of reduced calorie food. It could make your fat cat even fatter! So could food formulated for indoor cats. Most brands of both weight-loss and indoor cat food contain less fat and fewer calories than regular cat food but have high amounts of fiber. The fiber is supposed to make the cat feel full, but it rarely does. “Animals overeat if they can’t digest their food properly or if the food is lacking in some nutrients or some nutrients can’t be assimilated properly,” veterinarian Jean Hofve says on her website, Littlebigcat.com. Because they need to eat more to feel full, some cats actually gain weight on reduced calorie food, Dr. Hofve says. 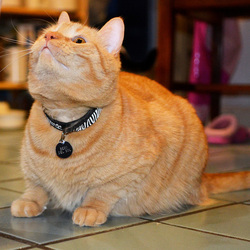 If you feed food made for indoor cats, it could be the reason your cat’s overweight. Helping a fat cat slim down doesn’t have to be a struggle for either of you. Just be mindful of your cat’s nutritional and emotional needs, and he will lose weight slowly but surely over time.